I used the cherubs with ivy topiaries to decorate the tables at the after rehearsal dinner when my son was married. 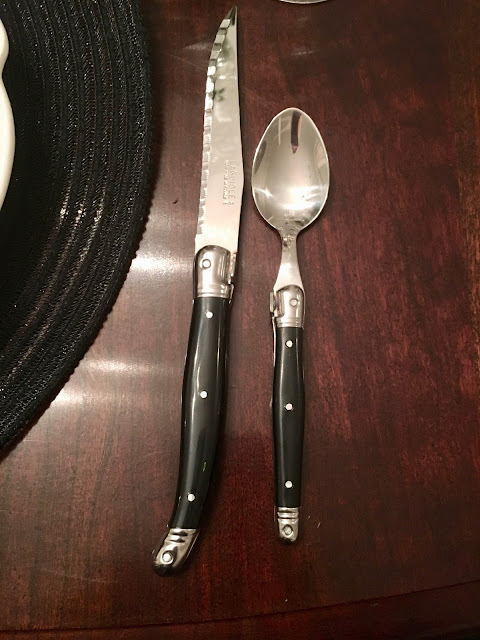 These are the three I kept and gave the others to the bride and groom, family and friends. I love to use them for Valentine's Day. They bring back special memories. Thank you for your visit. I hope you will leave a comment so I know you stopped in. tote please visit Patti at Pandora's box and leave a comment. She will be hosting a giveaway soon for a fabulous MC gift valued at 175 dollars. Delightful, beautiful and creative! I love your cherubs and little sparkly hearts. Your flowers and containers are lovely. This is just heavenly. Happy Valentine's Day! Such a beautiful table Emily. 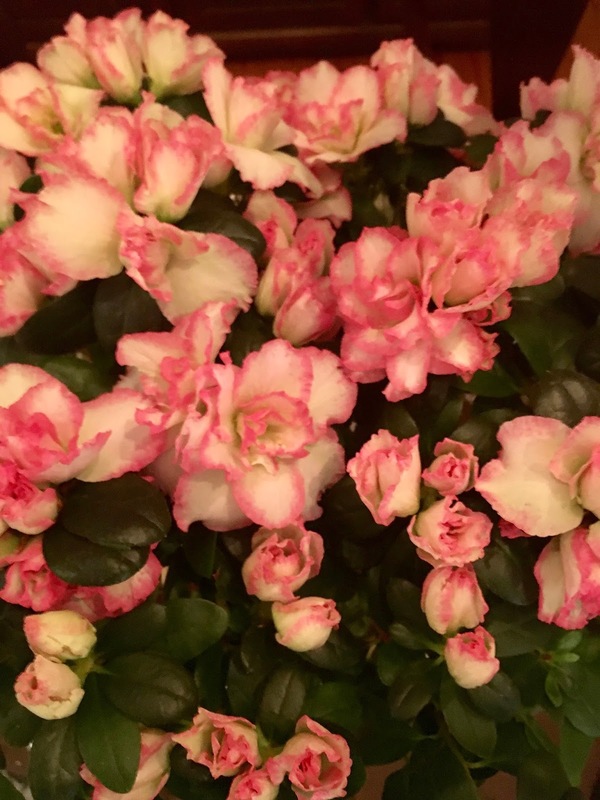 I love azaleas so I was drawn to your title and couldn't wait to see your post. 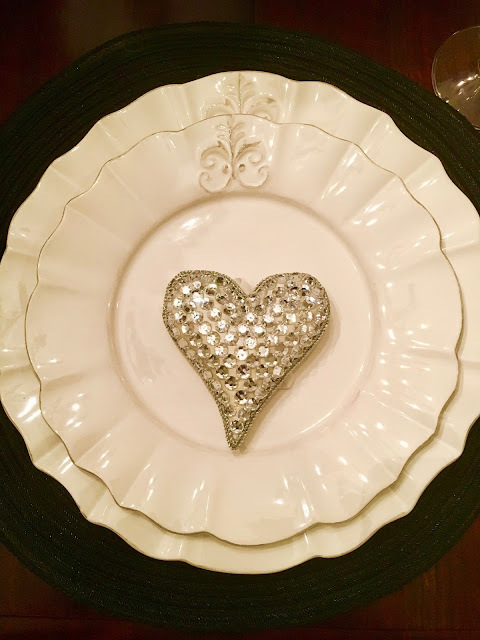 Love your sparkling hearts on each plate. 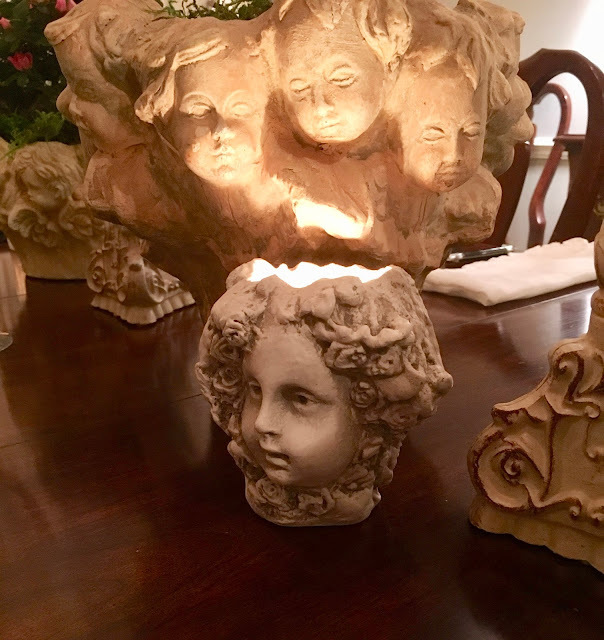 It's always nice to use pieces on your table that hold a special memory such as the cherubs from your son's wedding. Enjoyed!! Elegant and romantic. Your table is the perfect essence of Valentine's DAy! I hope yours is happy! Oh Emily this is just gorgeous! The oh so special cherubs are so perfect for Valentine's day!! Your everyday china doesn't look everyday to me, it is so pretty! 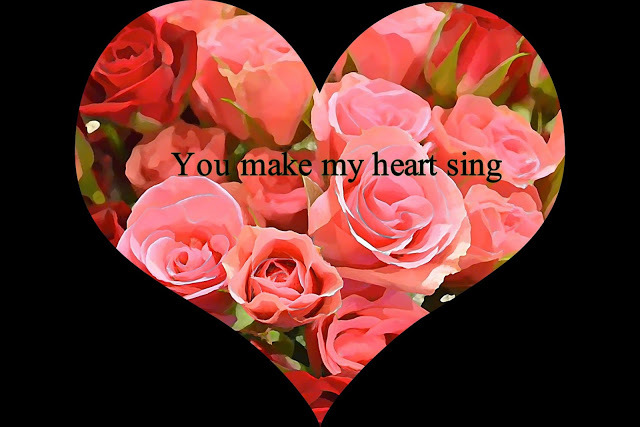 The sparkle hearts are just the elegant touch to make everything really sing!! Have a wonderful day, I hope the rain doesn't ruin your excursion and I will see you Sat! Happy Valentine's Day, sweet Emily!! Right after I finish writing this I am running to my nursery to see if they have one of those gorgeous topiaries in stock!! It was supposed to be bright and sunny today but it is gray and ugly. That azalea would brighten everything up. Have a wonderful evening and thanks for the inspiration!! I feel guilty. All I made for Valentine's Day was reservations! Rita, nothing blooming except the daffodils and hyacinths. We are seeing some to the trees budding out! Or is that Anthroplogie china? Regardless, it's gorgeous! Yes, it's Anthro Rita. I just love it! Gorgeous table setting! 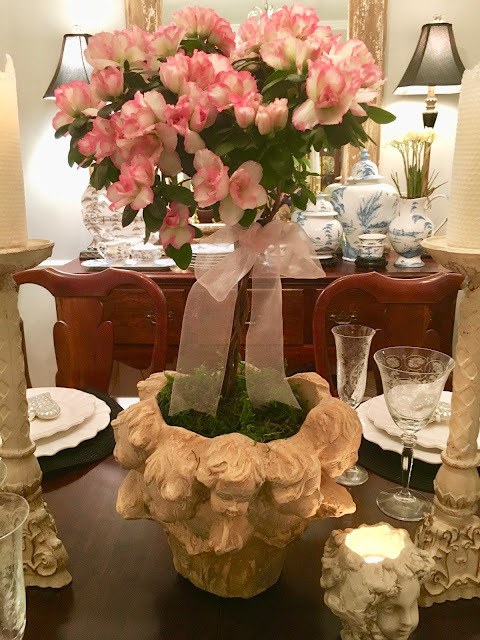 Love love your cherubs and flowers and the china is beautiful! Happy Valentines Day! 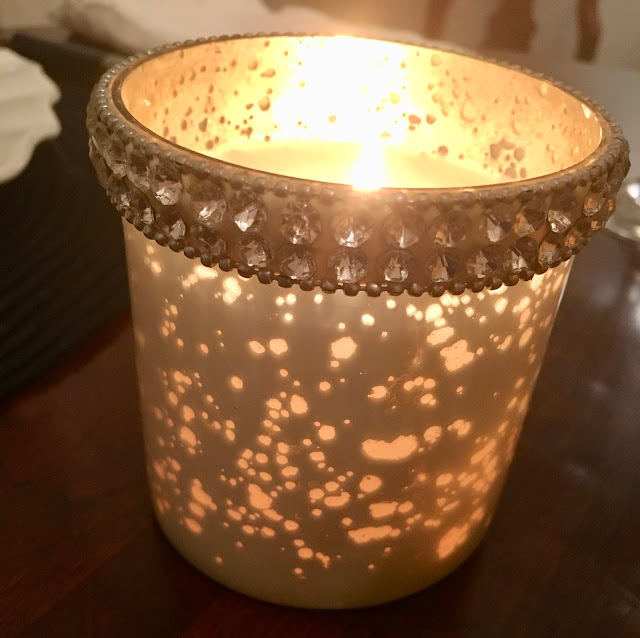 Beautiful table - such pretty china and I especially like how your beeswax candles have melted!! 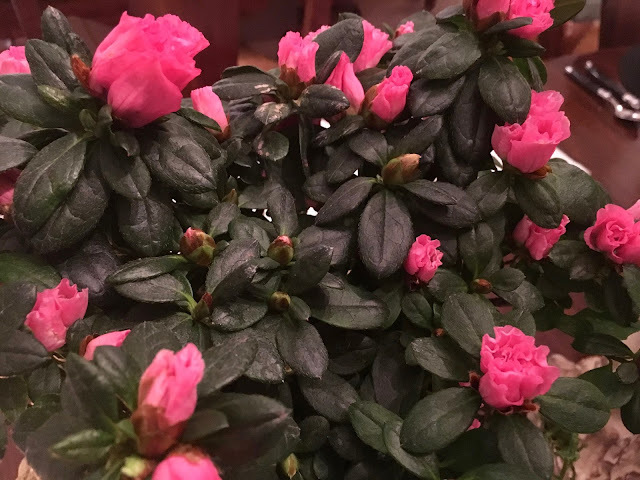 We won't see azaleas doe a few months around here!! 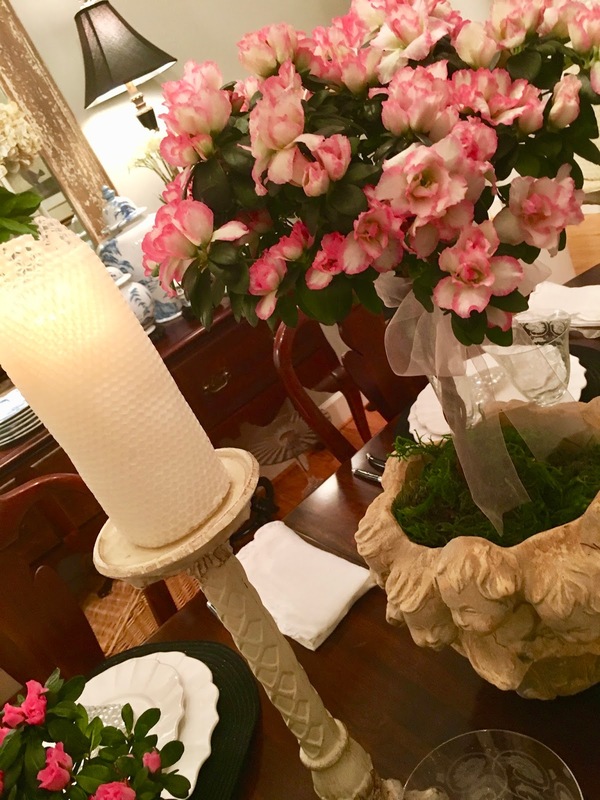 Emily, your table is gorgeous! 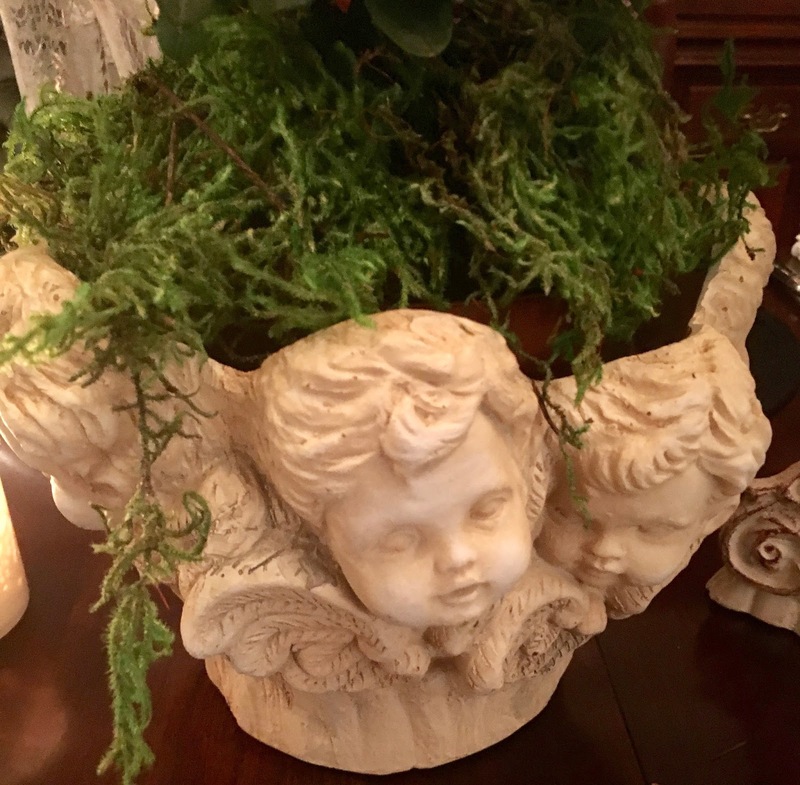 I love the pretty topiaries in the cherub planters. 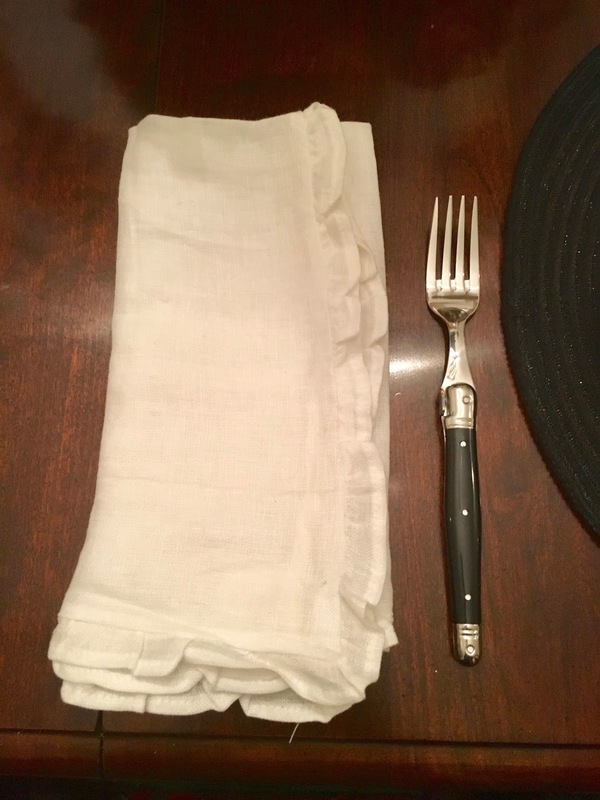 I also love the ruffled linen napkins. I am addicted to pretty table linens! 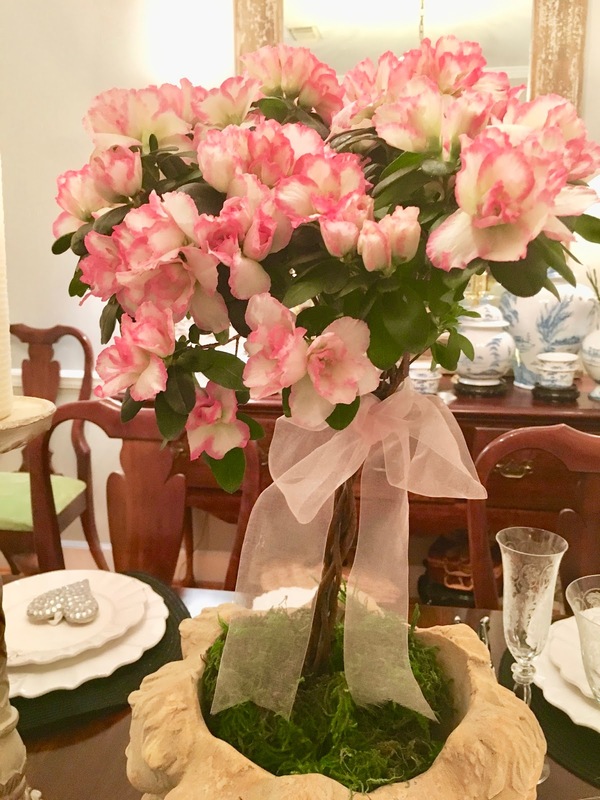 Such a beautiful table from the heart! Lucky you having azaleas :-) Hope you and Jim had a wonderful Valentine's Day. 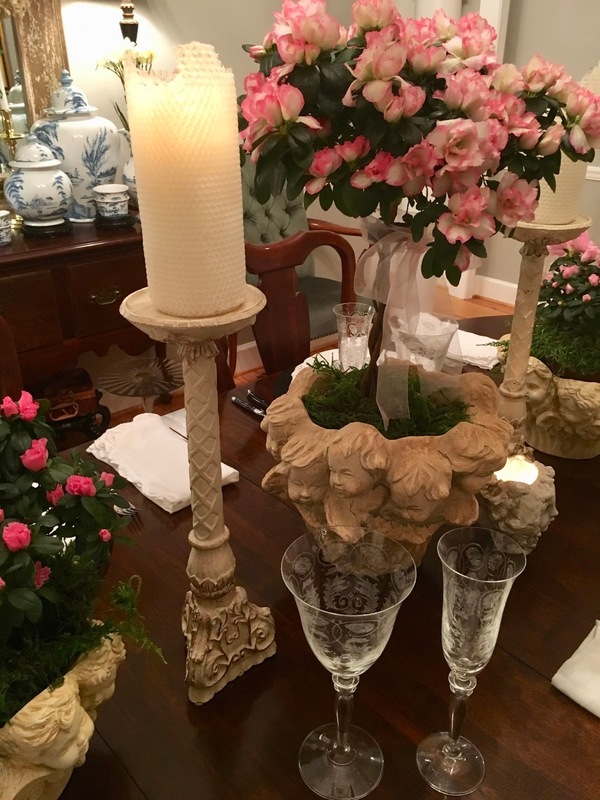 Your table is just beautiful, Emily, and holds such special memories with those adorable cherub planters. 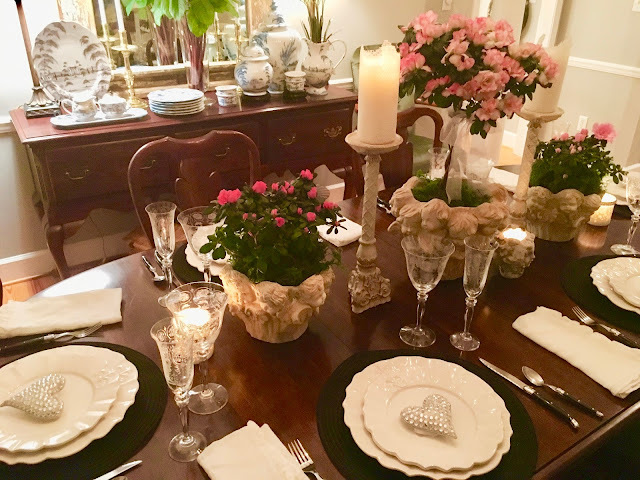 The ruffled napkins add such a romantic touch to your setting. I hope you had a wonderful Valentine's Day! 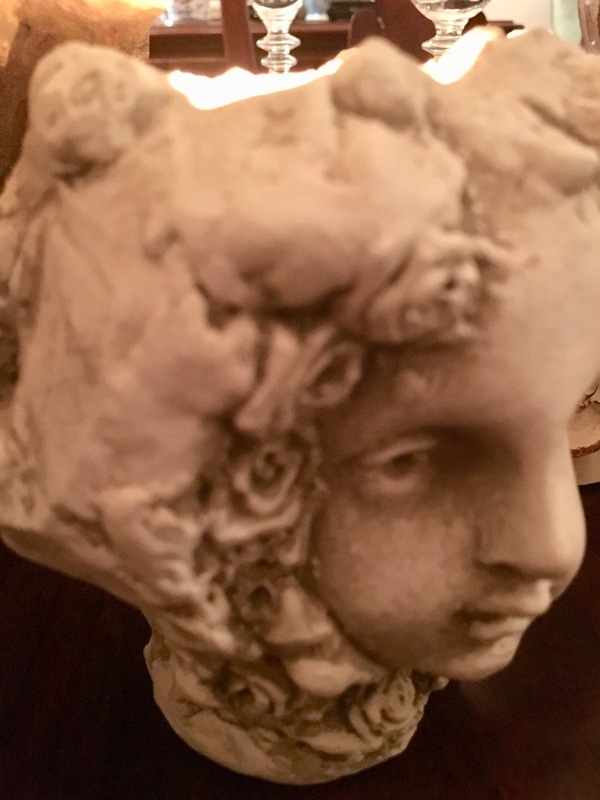 I have a 'thing' for cherubs and hope to acquire one or two in our new digs. 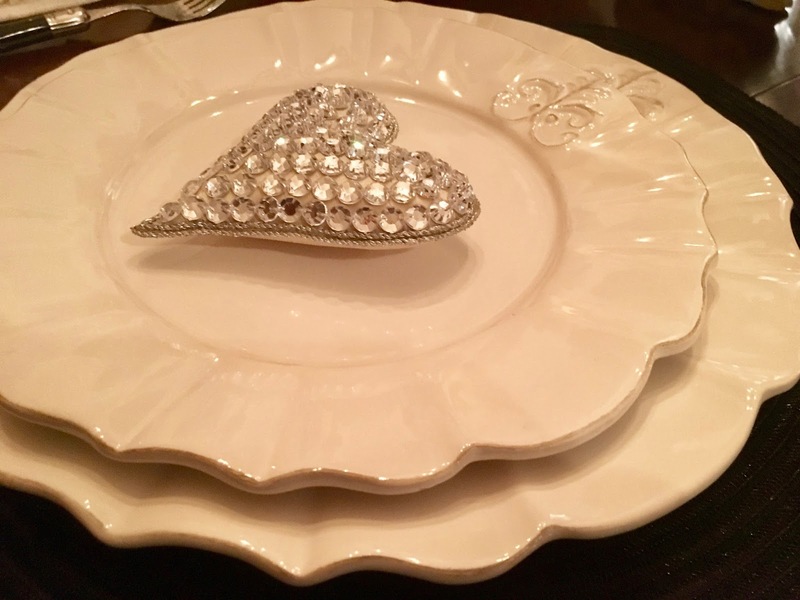 Love your china too! Beautiful and romantic, why not, full of love it is ! The cherub planters are awesome as much as your memories. Every detail is lovely Emily. 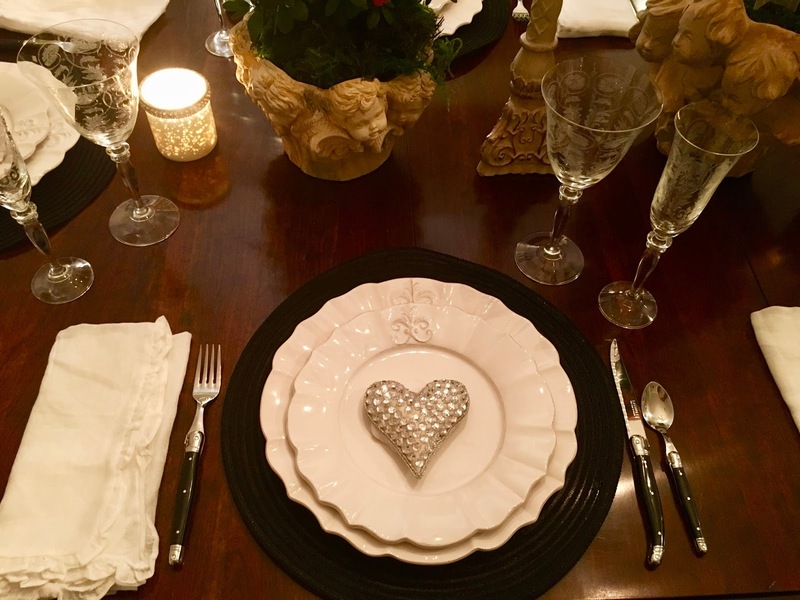 Emily, I'm late arriving for your beautiful table, but wishing you a happy belated Vhialentine's Day all the same. Your table and this post touch my heart. I love the elegance yet the simplicity of it all. The topiaries are magnificent! I can just imagine how pretty the rehearsal dinner must have been, and how special to have these keepsakes. The cherub urns are exquisite! Well done, my friend! This table is one of my favorites. Pinning these images!